Book today with Jamie for your Premium Private Small Group Tour of Hong Kong | an intense, unmatched local experience. The Hong Kong version of a "Small Group Tour" | 20+ people on a 2.5 hour scripted tour. Another "Small Group Tour" in Hong Kong with a flag waving guide working from a memorised script. Most popular Tour | the 8 hour full day Private Small Group Tour of Hong Kong. Please note I only offer PRIVATE GROUP TOURS, I do NOT offer public group tours where anyone can join the tour. I do an awful lot of Private Small Group Tours of Hong Kong, by small 2 - 6 people. I can and have done larger groups of 14 | 15 | 16 people but I will need to confirm a price and availability. 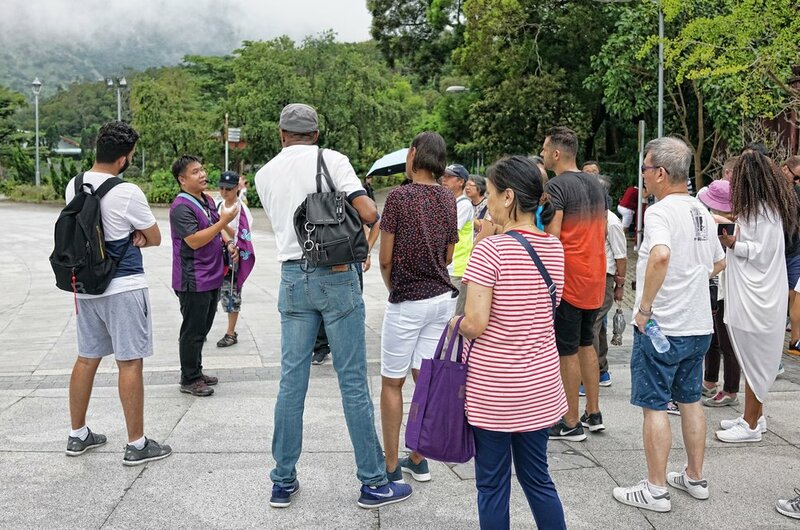 Generally small groups of people when coming to Hong Kong have traditionally booked a tour on a coach with 20 other people (or more) and you do a standard itinerary which literally has not changed on Hong Kong Island for about 55 years! and yes, they take you to a jewellery factory outlet under the guise of seeing how jewellery is made but the reality is 30 minutes of hard sell in a locked showroom... and yes, they also work to a memorised script and often the level of English is quite poor, I have done these tours in the interests of research and I am merely pointing out the facts. Other small groups such as the younger generation will join Free Walking Tours which have become popular Worldwide in the past few years, again I think there are issues, the organisers | guides say the tour is free but it isn't, there is a suggested tip which you basically have to pay, they try and up sell paid tours on the free tour, the tour is typically 2 1/2 hours long, it is a memorised script, they guides uses a microphone and there is almost no chance of engaging one on one with the guide as time is a real issue, again, I have done these tours in the interests of research and I am merely pointing out the facts. Generally Coach Tour Guides and Free Tour Guides wear headsets, use microphones, use Ipads, carry flags and blow whistles and often they make you wear a badge or sticker so they can remember who you are and so as they don't lose you! All in all it is not a very satisfactory experience. ..but there is another option | book a premium, private small group tour with Jamie and I promise you an intense and unmatched local experience. Typically Small Groups end up doing a Coach Tour or a Free Walking Tour with a flag waving whistle blowing "local" tour guide | This is NOT me! This is me, I handle Small Private Group Tours | Generally 6 is the maximum number of guests | Larger Groups - I will have to confirm. ... and a trip to Victoria Peak on Hong Kong Island should be no. 1 on everyone's bucket list, even the kids.